Cranborne Audio is very proud to announce C.A.S.T. - Cranborne Audio’s solution for flexible, high fidelity, and cost effective audio distribution systems in the modern home, project, or professional studio and our first 2 C.A.S.T. breakout boxes - the N22 and N22H. The modern studio is full of headphone extenders, low-powered headphone amplifiers, and excessive cable clutter making cue/monitor mixing complicated, messy, and uninspiring for the talent to listen to. Cranborne Audio has set out to transform audio distribution on stage or in the studio by replacing 4 balanced XLR cables with a single Cat 5e cable - our C.A.S.T. or Cat5 Analogue Snake Transport. By repurposing the internal copper wires and internal shield of a Cat 5e cable, the C.A.S.T. system transports 4 channels of balanced analogue audio over distances of up to 100m. Cranborne Audio have developed a range of products that are designed to live at either end of the C.A.S.T. 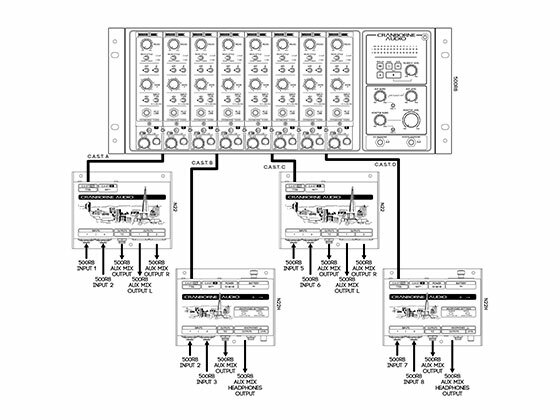 system and position I/O where it is needed; in the vocal booth, in the live room, or backstage. N22 and N22H are Cranborne Audio’s palm-sized solutions for reducing cable clutter and increasing signal fidelity. N22 is a 4-way cat 5 analogue snake that features advanced connectivity when used in conjunction with another C.A.S.T. enabled product. Featuring two combi jack inputs and dual ¼” and XLR outputs, N22 can transport four channels of balanced analogue audio over distances up to 100m using shielded cat 5 cable. N22H is a standalone reference-quality headphone amplifier as well as an advanced headphone distribution system using Cranborne Audio’s C.A.S.T. system. N22H provides headphone connectivity where it is needed, right beside the artist/musician using a single Cat 5 cable. The built-in headphone amp can be used using an external 9v DC power supply or a 9v internal battery for over 5 hours of continuous use. Connect two units together using C.A.S.T. and you can send and receive two channels of balanced analogue audio between two distant locations; in the studio connecting your live room into the I/O of your audio interface, in a live rig connecting your mixing console to your power amps, or even at home connecting your surround speakers to your home cinema system. If a studio is built around a C.A.S.T. enabled product, such as the Cranborne Audio 500R8/500ADAT, you can connect N22/N22H into their C.A.S.T. Input connectors send mic/line sources connected to N22/N22H directly to 500R8/500ADAT’s inputs ready for recording. That same Cat 5 C.A.S.T. connection also transmits a stereo monitor mix generated by 500R8/500ADAT back down the same Cat 5 cable and directly into N22’s line outputs or N22H’s reference-quality headphone output. Each C.A.S.T. 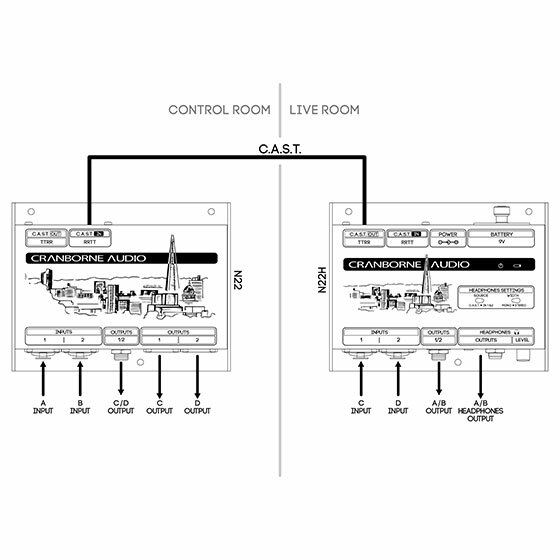 Cat 5 connection on a Cranborne Audio product features unique optimisation to ensure that the maximum signal integrity is transmitted over shielded Cat 5 cables for distances of up to 100m without high-end roll off and with minimal crosstalk. 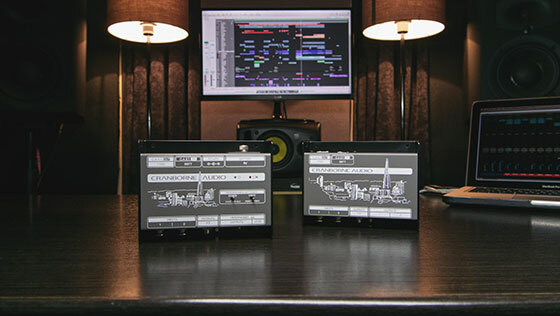 A palm-sized connectivity powerhouse, N22 and N22H are the perfect products for those looking to build their studio around a Cranborne Audio product but with their capability to be used standalone, they are also ingenious little tools for reducing cable clutter whilst increasing signal integrity, flexibility, and deployment convenience. The Cranborne Audio N22 and N22H will be available Q2, 2019 with pricing to be confirmed. Cranborne Audio are exhibiting at Winter NAMM 2019, Hall A, Booth 11028.